Greeters are needed at all of the Masses / Services during Holy Week. If you are planning to attend any of these and have an extra half hour, please consider volunteering. Sign up today! For those in the second half of life, Barbara Lee, a spiritual director from New York City, will lead this day of reflection on April 25th, 10:00 am – 3:00 pm. The $15 registration fee will include lunch. Sign up today. Seton Day of Mercy gives individuals and families a Lenten Service / Almsgiving opportunity on April 13th. Choose from a list of opportunities at Seton or in the greater community to volunteer for a couple of hours. 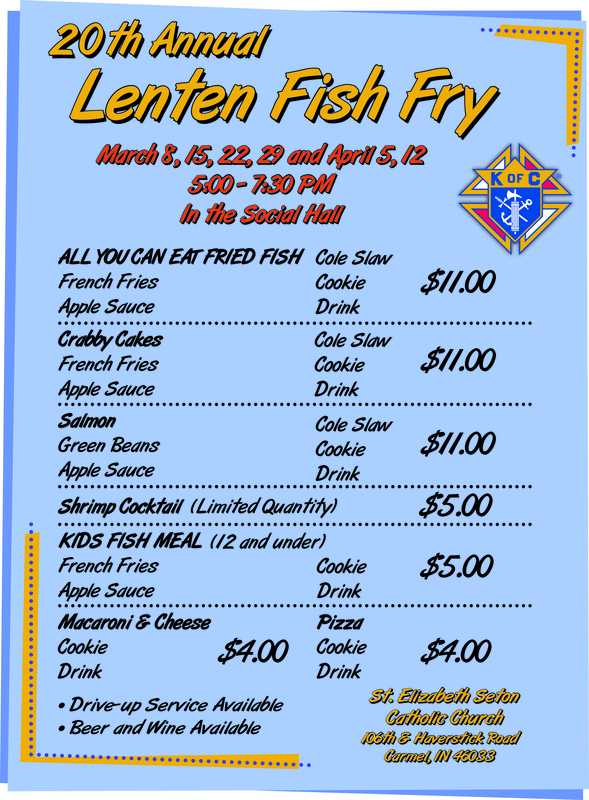 The Knights of Columbus will be holding Fish Frys every Friday through April 12th at 5:00 pm. Check out the menu for prices here. The Legion of Mary has planned a bilingual Marian Retreat on Saturday, May 18 at the St. Joseph Retreat and Conference Center (SJRCC), 1440 Division Rd, Tipton, IN from 9:00 a.m. to 3:00 pm, check-in starts at 8:30. This retreat is open to all, not just legionaries. This bilingual Marian Retreat features presentations by Fr. David Huemmer, Fr. Bob Williams and Maria Garcia, the Rosary, Saturday a.m. Mass and lunch. Topics for the retreat are Mary in Scripture, dogma, liturgical feasts and Mary as Mother of the Church. Cost: $25.00 which includes lunch (choose regular or vegetarian) and choose English or Spanish sessions. Print the registration form from the SJRCC website. Mail the registration form and payment no later than 5/5 to the address on the registration form. For more information or questions about the retreat, contact Lucy Mikula at (317) 848-5764 or email lucylm47@aol.com. Registration is now open for Seton Summer Series! It will be held the week of June 10-14, 2019 from 9:00 am until Noon, with an option to stay for the 12:15 Mass! 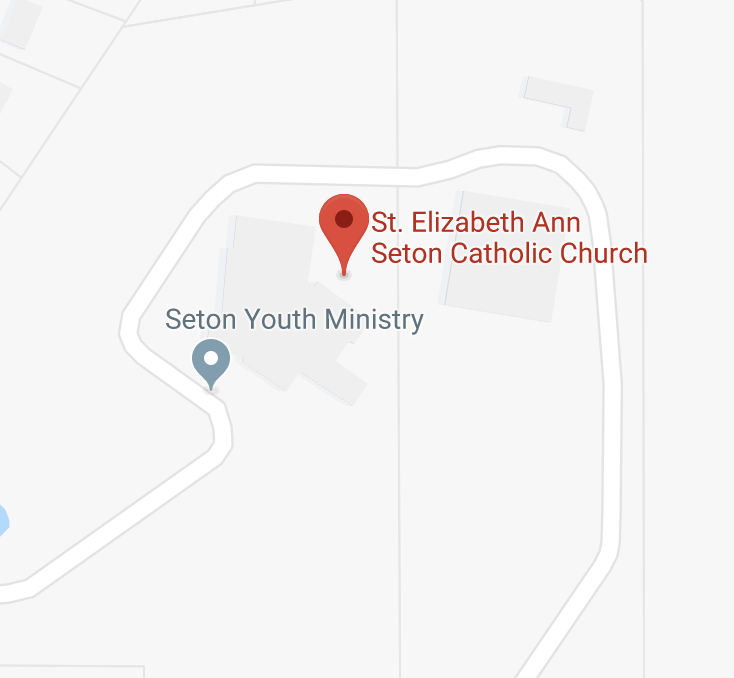 The Seton Summer Series is a week-long summer program that gives children a Catholic experience of community, service, and faith. Volunteers are needed throughout the week. Adults and teens!! Register today! SetonFest will be on July 25, 26 & 27. Make sure your vacation plans don’t interfere with this can’t miss event in Carmel! Momentum is a ministry for moms in all stages of motherhood. Meet with other moms. Build relationships with each other and learn ways to honor God Our Father together. Join us again this Fall! Awaken, a program for women continues throughout the year on Wednesdays at 1:00 pm. This hour and a half program will draw upon the Blessed Mother, Eucharist and other sacraments, Scripture and Saints, and Traditions of the Catholic Church. For more information, visit www.awakentothebest.com. on this program. That Man is You (TMIY) takes place every Friday at 6:00 am. Check the flyer below for more information about the program and speakers. Cafe Seton is open on Sunday nights throughout the year. Here is the menu for the next couple of months. To help out with Cafe Seton, please sign up here. To report an incident to the diocese, please visit the Diocese Website or call 765-464-4988.